I thought and thought about this and then thought some more and came up with a rainbow pineapple fried rice recipe that combines in-season summer vegetables. Developing palates will enjoy the medley of textures and flavors of the corn, peas, carrots and eggs, and digit-friendly self-feeding is crucial among the toddler demographic. I also like that I can make this recipe all year round by swapping in squash and other root vegetables or with frozen organic veggies, cutting down on the prep time which means more time to spend with your favorite munchkin(s). 1. Add oil to a large skillet set on medium-high heat. Once the oil ripples, add scallions and garlic, stirring constantly for 1-2 minutes. Do not let the garlic and scallions brown. 2. Add the diced carrots and pineapple and cook for 3-4 minutes until carrots are slightly tender. Add rice and season with soy sauce (or fish sauce), salt and pepper. Add more vegetable oil if rice mixture looks too dry and if you want to create some brown, crispy pieces. 3. 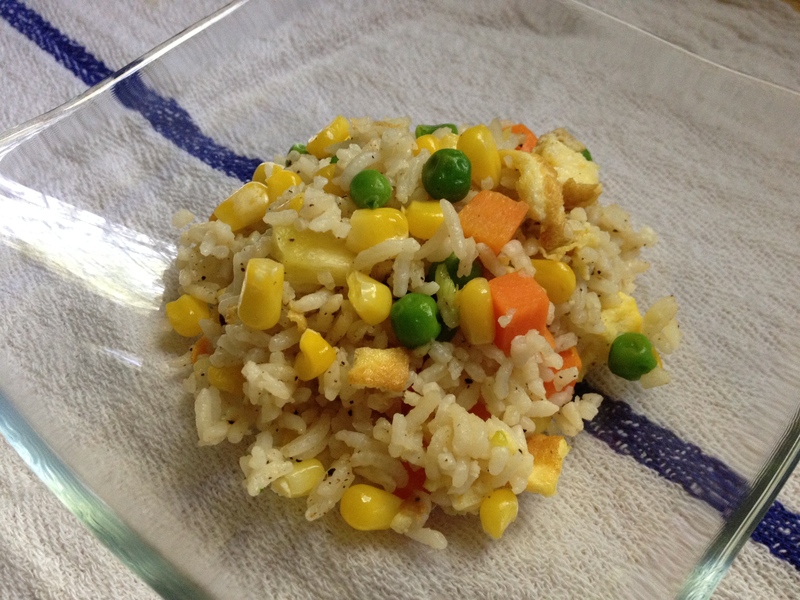 Stir in peas and corn to the fried rice and keep stirring for 2-3 minutes. Then add the diced omelet. Taste and adjust seasoning to taste. 4. Sprinkle fresh scallions on top, optional. Aw, My Linh – THANK YOU for this! 🙂 Gonna make it next week when we’re on vacay. You are awesome. With food AND words! Your little Campbell was my muse!! Our wonderful neighbor cooks up a delicious dish, with my son’s allergies as inspiration! Love it! Can’t wait for my little guys to try it.